This RV Garage with Workshop plan provides two distinct and specific work and storage spaces. 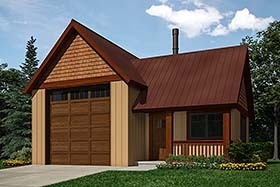 The RV garage portion boasts a twelve-foot ceiling sloping to fifteen feet with a 12’ wide by 12’ high overhead garage door. Extra natural light is provided by a large skylight. Plans could be modified to accommodate a rear overhead garage door for drive through ease if required. The 196 square foot workshop portion of this plan has an eight-foot ceiling height with ample work bench space including a wash up sink location. A wood stove makes this space a year-round functioning space. Or eliminate the stove to add additional work bench and storage.